My mother was born in the small town of Abbeyleix in Ireland, sixty miles southwest of Dublin, a few years after the Titanic disaster. She’s often told me that local people felt a strong connection with the Titanic, because the ship’s carpets had been made in Abbeyleix. Set up in 1904 by landowner Viscount de Vesci, Abbeyleix’s long-defunct carpet factory has recently hit the headlines because one of its earliest employees, Sarah Clooney, turns out to have been an ancestor – well, a distant cousin – of George Clooney. Four hand-tufted rugs from the factory were aboard the Titanic when she sank, and two of the hands that tufted them may well have belonged to Sarah Clooney. 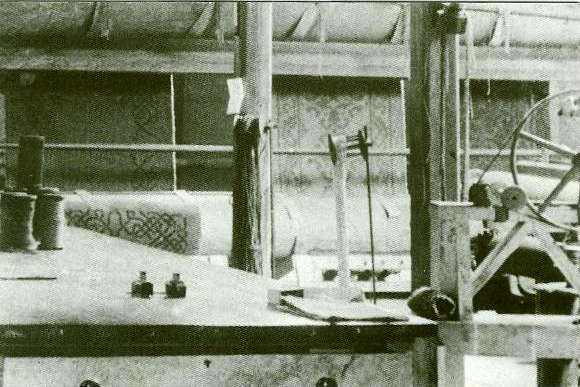 This photo shows the actual rugs being woven, on the loom in Abbeyleix. An exhibition in the town’s Heritage Centre tells the entire story. I should mention, though, that the Titanic held an awful lot of other carpets as well. The main manufacturer was James Templeton & Co of Glasgow, whose rather extraordinary factory, completed in 1892 and modelled on the Doge’s Palace in Venice, remains a Bridgeton landmark. Templeton amalgamated with Stoddard Carpets in 1980. As Stoddard International, the firm made the replica carpets that were used in James Cameron’s Titanic. The company has since gone into liquidation, but its original Titanic designs are archived at Glasgow University. This entry was posted in The Titanic herself, Titanic movies and tagged Abbeyleix, carpets, george clooney, Glasgow, glasgow university, hand tufted rugs, Ireland, james templeton, rugs, stoddard carpets, titanic disaster by RoughGuideTitanic. Bookmark the permalink.